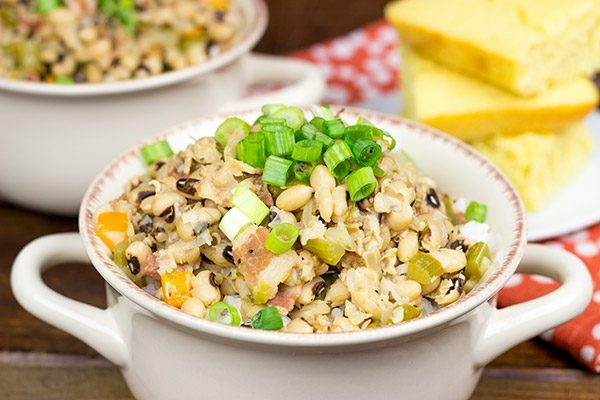 Bring good luck in the new year by eating a big bowl of Hoppin’ John on New Year’s Day! Well now it’s just you and me, 2015. This year has been a great one for us in the Spiced house as we welcomed a son to our family. That little bundle of squiggly baby has been a real joy! But all good things must come to an end, and it’s time to turn our attention to 2016. As you guys know, I grew up in Charleston, SC. Looking back, I definitely had a unique childhood. I grew up hearing tales of pirates that were captured and hung just a couple blocks from my house. I grew up hearing stories about the ghosts that lived in nearby houses. (Some say our house was haunted, too, but I’ll save ghost stories for Halloween!) If there’s one thing the South has plenty of…it’s superstitions. And as we head into a new year, we need to make sure good luck will be coming our way. 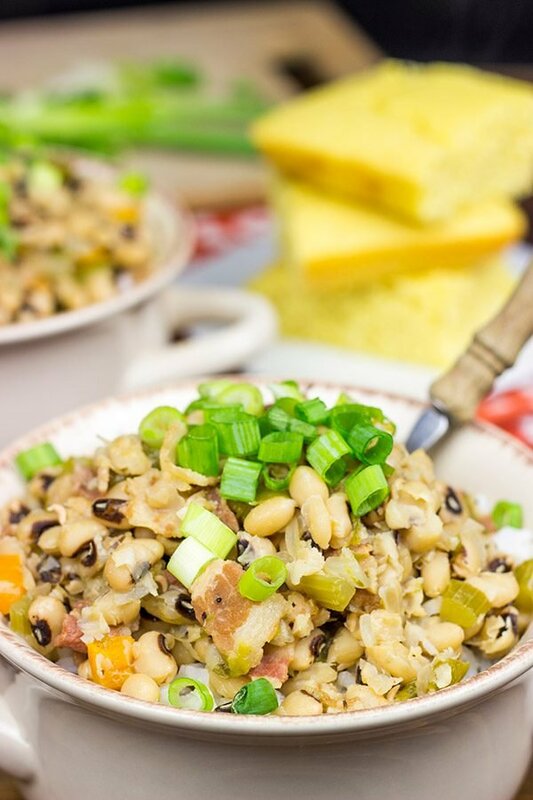 Hoppin’ John is a Lowcountry South Carolina dish that appears around New Year’s every year. 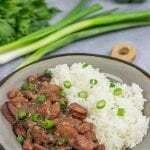 Superstition holds that if you eat Hoppin’ John on New Year’s Day, then you will have good luck for the coming year. The black-eyed peas represent pennies/coins, and indeed a coin is often placed under a bowl of Hoppin’ John when served. Like any good Southern comfort food, Hoppin’ John is best served with a batch of fresh cornbread. Cornbread is the color of gold, so it is said that eating cornbread on New Year’s Day will bring wealth in the coming year. 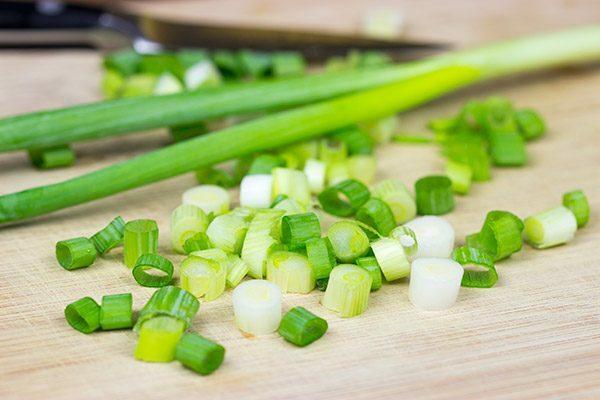 The green onions piled on top are also the color of U.S. currency. Sure, these superstitions might be a little weak, but I’m ok with that. I’ll take all the help I can get in the luck department! 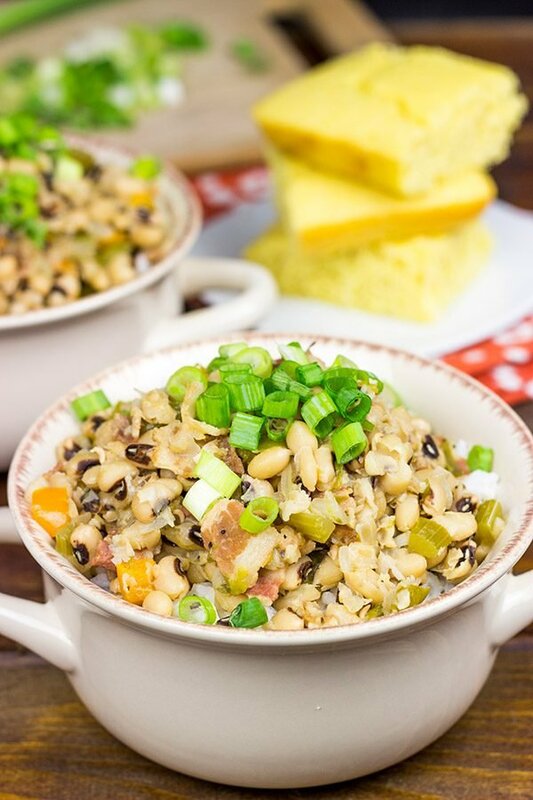 Plus, even if it doesn’t bring good luck, Hoppin’ John is just downright tasty! As a kid, I remember my mother always eating black-eyed peas on New Year’s Day. I didn’t understand it when I was young, but now I get it. It’s just what you do in the South. It’s an age-old tradition that goes back generations upon generations…so why mess with a good thing? Hoppin’ John reminds me of a Lowcountry version of Cajun Dirty Rice. It’s a bit “soupier” than Dirty Rice, and it uses bacon rather than andouille sausage. And of course black-eyed peas play an important role in Hoppin’ John. A lot of folks actually use the leftover ham hock from the holidays in place of the bacon. My wife always nabs the ham hock to make Ham Pot Pie (a strange yet tasty Amish recipe from central Pennsylvania)…so I used bacon in this version. But unlike most recipes with bacon, the bacon doesn’t get fried up for Hoppin’ John. Instead, the bacon just gets simmered in the broth and veggies, and it brings a nice smoky flavor to the dish. While Hoppin’ John is traditionally eaten on New Year’s Day, it can most definitely be eaten throughout the winter. It’s a tasty black-eyed pea + rice dish that will keep you warm on the cold nights that are a-comin’. Enjoy, and Happy New Year! Do you have any traditional foods that you eat on New Year’s Day? Place the black-eyed peas in a medium bowl and cover with several inches of cold water. Let soak for at least 6 hours, or overnight. Using a large saucepan, add the rice and water. Stir and bring to a boil. 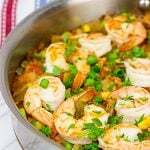 Once boiling, reduce heat to low, cover and simmer until water is fully absorbed (~15 minutes). (Tip: Do not stir rice once you cover the pan.) Once broth has been absorbed, remove from heat and let stand for 10 minutes before fluffing with a fork. Meanwhile, place a large pot or Dutch oven over medium-high heat. Melt the butter in skillet and then add onion, peppers, celery, garlic and bacon. Cook for 3-4 minutes, stirring occasionally. To serve, place rice in bowls. 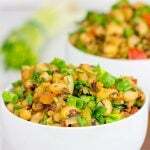 Top with black-eyed pea mixture and then garnish with green onions before serving. I got roped into the whole greens-black eyed peas-NY-dealio after I came to Atlanta. A roommate was into it big time and she would make a big pot of greens and black-eyed peas with ham and well, that’s kinda stuck with me – though I don’t use ham these days – I’m thinking I need to use bacon like you have done in this Hoppin John! Lil Shashi would gladly eat seconds if I made her your version of greens and black-eyed peas, David! Happy New Year to you, Mrs Spiced and Baby Spiced! Here’s hoping 2016 is simply fantabulous for y’all! Haha..it’s kinda hard to live in the south and not come across black-eyed peas on New Year’s Day. I don’t hear about it as much up north, but we still hold the tradition here in our house. Heck, we’ve made a similar version of this Hoppin John on totally random winter nights just because it’s a delicious comfort food-y type of meal. Thanks for being an awesome friend, Shashi…and here’s to an incredible 2016! Honestly I didn’t know what hoppin john was until I read about it in one of my cooking magazines this month. Ooops. Clearly you are all over this New Years Eve tradition! Plus there is bacon. Bacon is my Achilles heel. Don’t tell anyone. Happy (almost) New Year to you and your beautiful family!!! Hah! You need to start the Hoppin John tradition down there in NYC. It’ll be like the 2nd coming of chicken and waffles. Ok, maybe not. But it would still be a great tradition to start. Get on that, will ya? 🙂 Happy New Year, Lindsey!! David!! thank you for sharing this recipe I haven’t heard of it before! In Spain, there’s a tradition to eat lentils on the 31 December to bring good fortune and luck for the year to come! this is something to try! That’s really interesting about the lentils on December 31, Gaila! From what I’ve seen, most food traditions in the US relate to actual New Year’s Day rather than New Year’s Eve. Maybe next year I’ll have to cook up some lentils on Dec. 31 for good luck. Thanks so much, and Happy New Year! Oh my gosh, don’t even get me started on Southern traditions…especially those in Louisiana. That’s one of the things I loved the most about lilving in Louisiana. And it’s one of the things I miss the most now. Fortunately, I can still make the food…even if I live 1000’s of miles away. 🙂 Happy New Year to you and your family! Thanks for being an awesome friend! What an interesting tradition of eating black eyed peas on New Year! I’ve heard of “Hopping John” and knew it was some kind of food, but never knew what exactly it was. Now I know and definitely want to try Hopping John – it will be on my list of recipes to try in 2016! Haha! Well now you know the story behind Hoppin John. Honestly, this is an excellent comfort food type of meal, and we often just make it on a cold winter night. Maybe that brings us an extra dose of luck. (Not sure about that one, but hey, it’s worth a shot, right?) 🙂 Happy New Year, Melanie! Thanks so much, Manali! Hoppin John is a great comfort food type of meal…and the black-eyed peas bring good luck (at least according to tradition). Thanks so much, and happy 2016 right back at ya! Does it count if I go to a Black-Eyed Peas concert? Or do I have to actually eat black-eyed peas? Yes, going to a Black-Eyed Peas concert will also bring good luck. Especially if you go on New Year’s Eve. And double especially if you eat a can of black eyed peas while at the concert. This looks so good! It sounds like its been a great year for you – I hope 2016 is the same! Happy New Year! have a GREAT magical New Year! What a great story David! I love this Southern tradition! I will definitely need to try a bowl soon! Thanks so much, Shelby!! It’s fun when food has a good story behind it, right? 🙂 Happy New Year! Oh my goodness! This is so fun! What a great tradition. I’ve never heard of it before, but it sounds super fun! That coin idea is so clever! What a fun way to bring good luck into the New Year!! 🙂 Happy 2016! Happy New Year David! I hope you and your family had a great one! I have never heard of this dish before, but I am all about beans and even better with hot sauce. Thank you so much, Summer! Happy new year! This may be the best recipe name ever! Hoppin’ John. Hoppin’ John. Hop hop hop. I grew up in Florida and lived in Atlanta for a coule of years, so I started making a version of this many years ago. This is the first year I didn’t make, and I had a really rough week after New Year’s, so I’m making it soon! Besides the good luck, it is just plain good, and I live in the Caribbean now, so like you, pirate stories and ghost/jumbie stoies fly around here all the time! I’m sorry to hear about the rough start to the new year, Cathy. But there’s always time to make Hoppin John…it’s just a good comfort food type of meal! And I can’t even tell you how jealous I am that you live down there in the middle of pirate and ghost story central now. 🙂 That is awesome! Thanks so much for stopping by and commenting. Hope your weekend is better than this week!